You are here: Home › News › What is the value of estate or inherited jewelry? What is the value of estate or inherited jewelry? We are regularly asked ‘what is this jewelry worth?’ – as if the owner expects the value to increase over time. That’s a common misconception about the jewelry market. But what happens when you have inherited a large amount of jewelry? Maybe mom passed last year, surviving dad by six years. Sure, he loved buying her expensive jewelry and purchased lots of it. But now you are the executor of the estate and must determine what to do with it. It doesn’t fit your lifestyle and none of your siblings or the surviving grandchildren are interested. So, what do you do with mom’s jewelry? What is it worth? What can you get out of it? If mom had a “list”, distribute specified items to the heirs. If there is any other family interest, you can divide the jewelry among members, possibly an informal lottery. You will likely have leftovers, which is when you can consider remaking or liquidation. Some of the items in the estate will not be to your liking – old designs or simply not the right “look”. At Quenton Elliott Jewelers we can assist you in re-designing those outdated pieces. We can create a spectacular new “look” that can again be worn knowing that you have a piece of history – the elements of mom’s jewelry on your finger or around your neck. 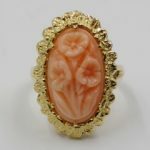 A fluted coral carving ring made from grandmother’s bracelet. 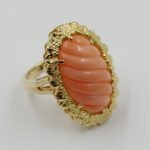 A redesigned coral ring made from grandmother’s bracelet. It’s not as easy as you think. There needs to be an accurate description of the items and a reasonable value placed on the items. Even with that done, the average “owner” will have a tough time finding the sources that can purchase the items outright. We do know that pieces from a “branded” retailer will have a higher value simply because it came in a “blue box” or from other internationally known retailers. This should be handled through a qualified “seller.” We at Quenton Elliott Jewelers have generations of experience in finding the right buyer to assure the maximum return on the items/estate. We are able to properly evaluate and present the items to qualified buyers in the U.S. and overseas markets. We always remind people that jewelry isn’t so much of a financial investment as it is a security. You can’t always expect the value to increase, but it will be worth something. Whether you want sentimental or financial return, we can help you find the best solution to fit your needs. You can contact us at (713) 528-1641 or info.qemto@gmail.com.